Posted by Vicky Tiffany on Jan.9,2018 15:54 pm. ISO image burning is rather a need when your system is compromised due to malware attack and you need to format, or you need to reset your forgotten password of your admin account. Thus if you are not fully aware of how to burn ISO image file onto to disk especially on Mac computers, this article would be the best guideline to show you the methodology. Mac besides windows computers has got certain discrepancies which makes it a bit different from others, but if you have got the right ISO image burning tool to accomplish your task, Mac computers can be as supportive as the Windows computers. Besides, the user needs to have a basic idea of what burning of ISO image file means exactly. Well, if you are not fully aware, then you should know that ISO image files are fragmented files or achieve files of an optical disk which are compressed in the form of an Image called ISO image. It is specifically characterized by the extension it uses, that is .iso file. Thus if you want to create a Windows 10 bootable USB on mac then you have to burn the ISO image files onto the disk by segregating a partitioned zone within the disk to avail the compressed files and make them executable. 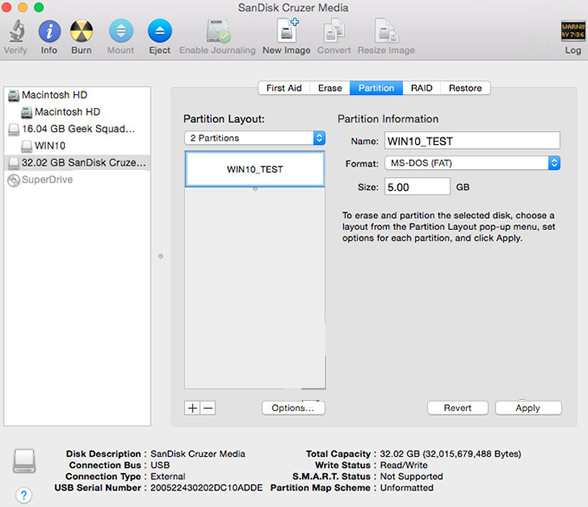 The methods in this article will show you how to create a Windows 10 bootable USB/DVD on Mac . Keep reading to know them in full-length. 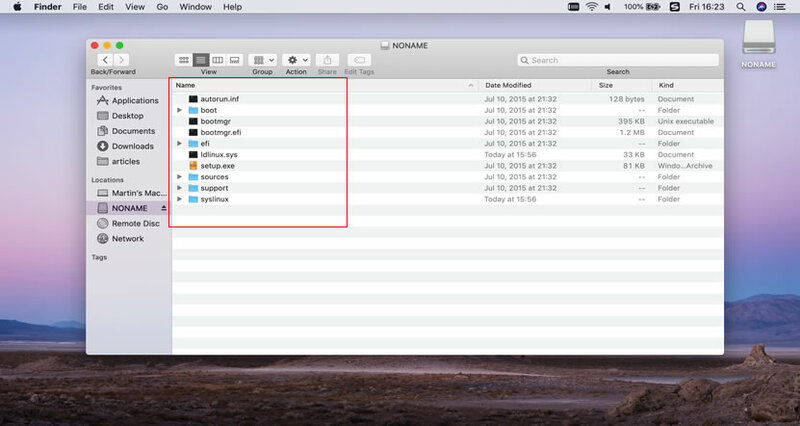 Instead of trying out with an external agent, it would be better to make use of the in-built application of Mac, called Disk Utility to burn the ISO image files on disk to make them bootable. It comes pre-installed with the Mac OS so you don't have to worry about its downloading and installation. Just follow the steps below to burn ISO files to USB/DVD on Mac OS X. Step 1. Go to the "Applications" and then "Utilities". Step 2. 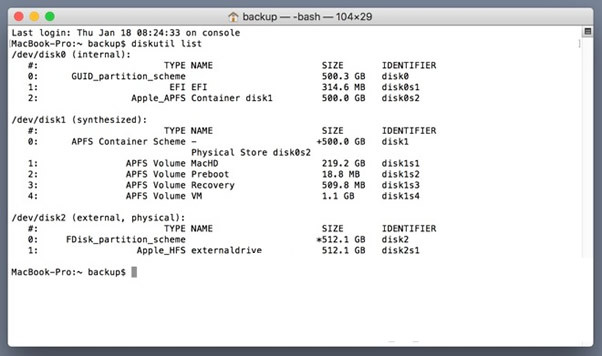 Locate the app "Disk Utility" from the apps available on the "Utilities" folder. Step 3. Now pull down the fileStep 4. Browse to the ISO image file that you want to get burnt into your specific drive and click "Ok". menu and choose "Open Disk Image". Browse to the ISO image file that you want to get burnt into your specific drive and click "Ok". Step 4. Insert the empty disk, be it CD/DVD or USB with a comparable storage capacity depending upon the size of the ISO image. Step 5. Now click "Burn" to burn the ISO image files into the disk and wait until the burning is completed. Sometimes the app might intermittently stop in between the process if the file size is too heavy. Errors are reported with Disk Utility. and only works with OS X 10.10 or lower. There are bugs issues, present while burning the ISO image files. Mac OS comes with a great a tool for making bootable USB/DVD from ISO, but unfortunately, it doesn't seem to work for burning ISO images to USB drives on Mac because it may comes with some sort of cryptic errors. 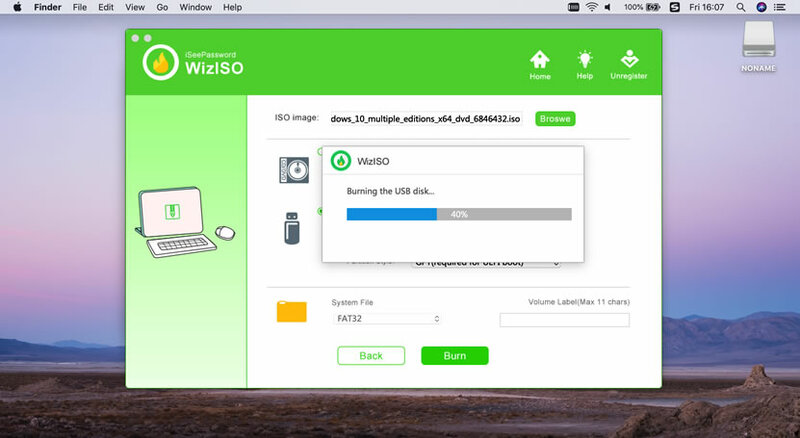 Here we will introduce a professional ISO burning tool for your Mac OS X. iSeePassword WizISO is an astounding ISO burning tool which supports both Windows and Mac computers and give you ability to create Windows 10 bootable USB on Mac OS with easy. It provides 5 powerful key feature including ISO Burner, ISO Extractor, ISO Maker, ISO Editor and Copy Disc based on different needs. Here in this section, we would only focus on burning ISO image to USB/DVD on Mac OSX. 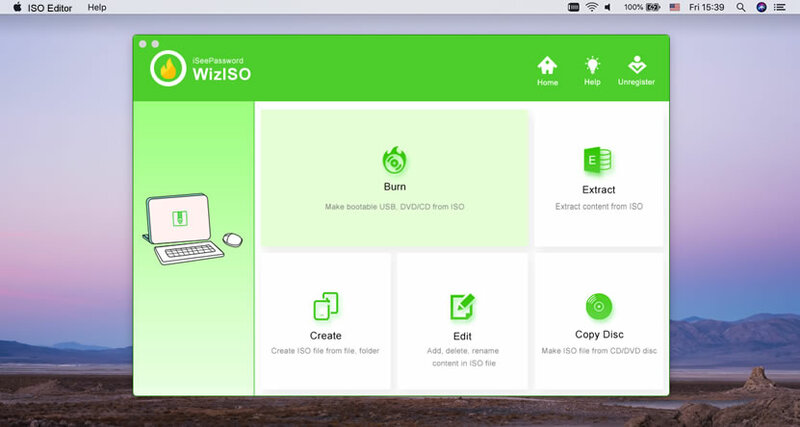 WizISO has been incessantly serving countless users across the internet with its exceptional service and its advanced features which makes it different from other ISO burning tools. 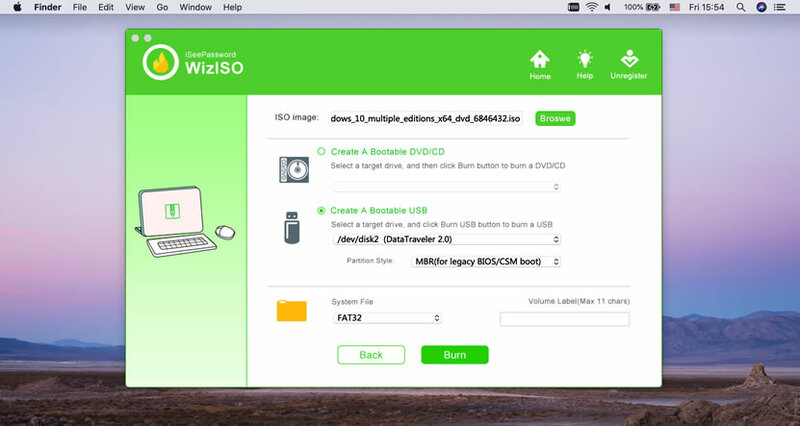 Just 3 simple steps to burn ISO to USB/DVD on Mac OS X without getting errors. It combines 5 functions: Burn, Extract, Edit, Create and Copy Disc. It works for both GPT (UEFI boot) and MBR (legacy BIOS/CMS boot) modes. It supports all types of system files- FAT. FAT 32, and NTFS. Step 1. Get the program file downloaded on your Mac OS X. Launch it admin privileges so that you can exercise all the admin rights. (It may ask you to type the Administrator password). Step 2. You can it combines five functions including Burn, Extract, Cretae, Edit and Copy Disc. Firstly click the "Burn" option to open main interface and browse the ISO image source file from the source location. Step 3. Either choose "Create a Bootable CD/DVD" or "Create a Bootable USB" depending upon the type of disk you are using to burn your ISO image files. Insert your USB or DVD/CD to your Mac OS X. Select your file format from the "System File" section as FAT, FAT 32, NTFS. Step 5. After you have chosen all your priorities, click on "Burn" button to burn the ISO image file. It will take few minutes and your bootable disk will be created with the ISO image burnt onto the disk. Burning ISO image files on Mac is not that difficult job to pull off unless you have the basic idea of ISO image files and have the right choice for burning ISO tools. Form the article above, you can clearly deduce that iSeePassword ISO Editor for Mac is the only reliable burning image tool with no demerits or limitations at all. It has been tested with many brands of computers and operating systems including the Mac OS, thus you can completely rely on it to burn ISO file to USB/DVD on Mac OS X without getting any errors. If you're Mac Sierra users then you must notice that Apple has stripped the function to create Windows 10/8/7 bootable USB/DVD from ISO on Mac Sierra and Macbook air. So it makes it very difficult to burn a Windows ISO to USB on Mac OS. But you still have a choice to do that by using Terminal command although it's very complicated. But there are many potential errors when burning ISO to USB on Macbook air or high sierra. Most Mac OS X cannot load the IntelMEI driver and pop up a "Windows Setup could not insatll one or more boot-critical drivers. and restart the installation". However, most of time it's working and your data will be copied. Step 1. Open the "Finder" option then "Terminal" app. Now, type "diskutil list" to find out which one is the USB flash drive. Step 2. Let's say your USB drive is "disk 2", so first we will have to format it in the Terminal app by typing diskutil eraseDisk ExFat "WINDOWS10" MBR disk2. Step 3. By entering this, the app will format the USB drive and name t "WINDOWS10" so that you can use it as an installer. Step 4. Assuming you have downloaded the Windows 10 .ISO file and it is stored in the Downloads folder. So, go ahead and mount the .ISO by opening it. It should be named as " CCCOMA_X64FRE_EN-US_DV9"
Step 5. Now, on the Terminal app type the following to copy the files of Windows 10 to the USB flash drive. "cp -rp /Volumes/CCCOMA_X64FRE_EN-US_DV9/* /Volumes/WINDOWS10/" . This will take several minutes to complete but your data should be copied and the flash drive will be bootable. You can use it install Windows 10 on any desired system. Then you can be able to install your Microsoft Windows 10/8/7 system on Intel-based Macintosh computers. Most Mac OS X cannot load the IntelMEI driver and pop up errors on Macbook air or high sierra. Won't support UEFI and 64bit Windows 10 ISO. Command line operations, not intended for the beginner and at your own risk.